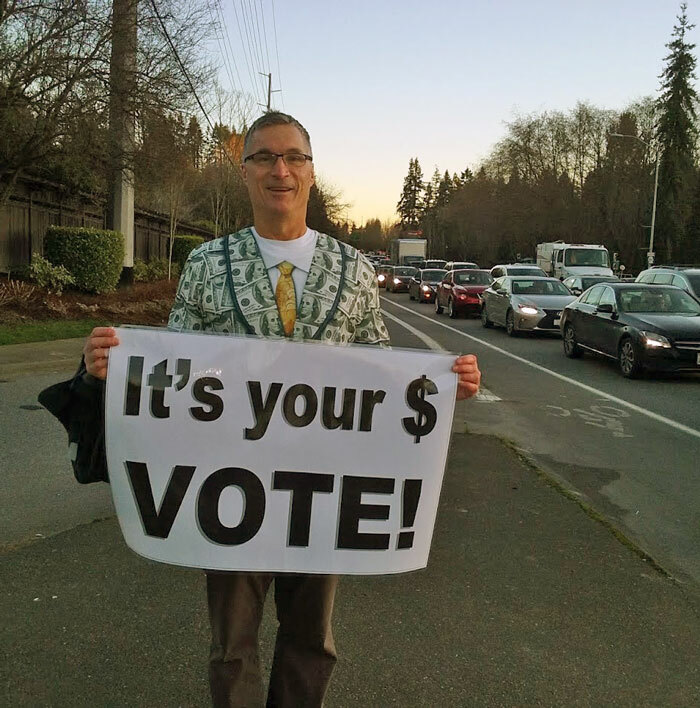 Everett School District levy opponent. Photo courtesy of Jeff Heckathorn. Voters are approving the levy to fund the Everett School District’s ongoing operations, but the bond measure that among other things would build a new south-end high school has not received the super majority necessary for passage. As of Friday afternoon, February 16, 2018, all but about 500 special election ballots have been counted. Both of the Everett School District levies garnered about 55% approval votes so far. The operations levy, also called the enhanced program levy, only needs a simple majority to pass and is sure to be successful. It won’t take effect until 2019, and even then, might be capped by state law. More about that later. The construction bond levy needs a 60% super majority for passage and has no chance at this point. What’s next for the Everett School District’s construction bond? The Everett School Board could ask voters again in April to pass a revamped construction bond, but that one might not pass either. The failed construction bond would have built a new south-end high school to alleviate overcrowding at Jackson and Cascade high schools, added additional permanent classrooms to existing elementary schools, added vocational learning areas to existing high schools, modernized Everett High School to extend its life, purchased land for another new elementary school, and upgraded HVAC/electrical systems throughout the district. A revamped construction bond might eliminate a number of those capital projects. Adding more portables at Jackson High, which already has 17. By 2023, without a new high school, Jackson will have 30 portables on campus, possibly on tennis courts, parking lots and/or athletic fields. Adding more portables to Cascade High, which has one portable now. Without a new high school, Cascade will have eight more portables in the next five years – by 2023. Balancing enrollment at the existing three comprehensive high schools by shifting boundaries so some students now attending Jackson move to Cascade; some from Cascade move to Everett High. Such boundary shifts would involve more student busing – a cost that comes from the same fund which pays for instruction. Double shifting – One group of students attends school early in the day; others go later in the afternoon. Staggering shifts – For example, nine periods a day with students starting and ending at different times to reduce the number who are in the school at one time. Enacting year-round school, with a variety of schedule possibilities. What’s next for the Everett School District’s operations levy? Snohomish County property tax bills now arriving in mailboxes are higher than last year thanks to the Washington State Legislature’s effort in 2017 to address the state Supreme Court’s McCleary decision. They increased state school taxes in 2018, but automatically reduced local school district operations levies in 2019 with a levy swap. School district officials say that the legislature hasn’t clearly defined the difference between basic education funded by the state and enhanced programs such as special education funded by local school district operations levies. They believe the cap may be lifted in this year’s legislative session so that basic education can be fully funded locally. If this cap is not lifted by the state in this year, the newly passed operations levy rate will be automatically reduced to $1.50 per $1,000 by the county assessor in time for next year’s property tax bills.